Jell-O is so gay and sparkling! I bought some cheesy advertising cookbooks from Dottie's Vintage Cookbooks for a vintage cookbook swap at Swap-Bot. Before they go off to their new homes (well, I'm keeping one), I wanted to post some of my favorite images and text. The one above is from a booklet printed in 1934. 1. 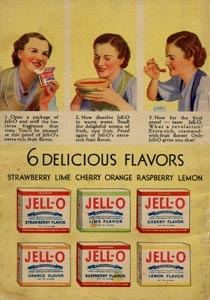 Open a package of Jell-O and sniff the luscious fragrance that rises. You'll be amazed at this proof of Jell-O's extra rich true-fruit flavor. 2. Now dissolve Jell-O in warm water. Smell the delightful aroma of fresh, ripe fruit! 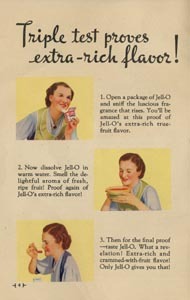 Proof again of Jell-O's extra-rich flavor! 3. Then for the final proof- taste Jell-O! What a revelation! Extra-rich and crammed-with-fruit flavor! 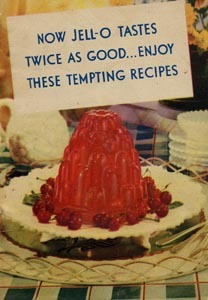 Only Jell-O gives you that! 1934. Same image but I love the little boxes of Jello below it. 1934. 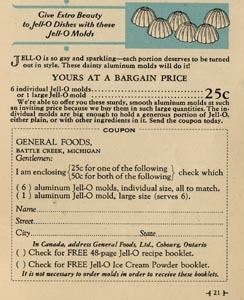 "Jell-O is so gay and sparkling- each portion deserves to be turned out in style." 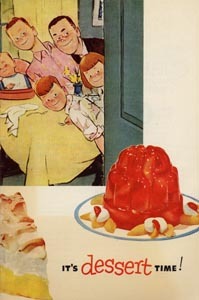 Oh, I love vintage Jello molds! My dream kitchen has a few, maybe some on display on a shelf or one hanging on the wall. A recipe booklet from Campfire Marshmallows. 1952. This one is from Lea & Perrins Worcestershire Sauce. "If you have a husband who likes to cook, pamper him. Encourage him! You are lucky indeed, even though you find yourself only a fetch-and-carry maiden while his genius glows. But men are wise, not one in a thousand really wants to take over the job. They usually have a few specialties to produce on occasion and leave the rest of the cooking to us. So, what do we do? 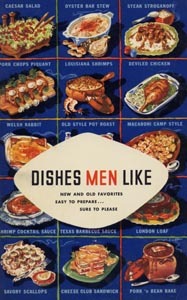 It goes without saying that most women choose dishes men like. And men have definite likes and dislikes about food." "Don't wait for your man to ask for the Worcestershire. 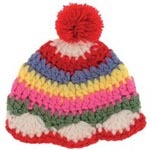 Include it with the salt and pepper shakers when you set the table." I thought it would be fun to create a category ("Vintage Obsessions" which I don't like but I can't think of another title right now) here for my favorite things to look for when I go to antique stores and thrift shops. Egg cups are so cute! There's a good history of egg cups here (oh lord, I'm a nerd). And here you can find instructions on how to properly use an egg cup. Egg cups were never a big deal in this country so it's hard to find them in American antique stores. My favorites are the goofy little wooden (or plastic) people with an opening in the head so it looks like they have a big egghead, kind of like the Noddy egg cup above. I don't actually have any egg cups yet, because I'm on a quest for the Perfect Egg Cup. I found it once, but when I went back to the antique store, it was gone. 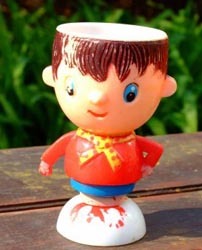 I just found this blog and the writer has a great egg cup collection. The little girl in the blue dress might just be the Perfect Egg Cup. A person who collects egg cups is called a pocillovist!